A newspaper article from 1984 about the Hatters Junior Netball League. The Crawley Sports team, winners of the Luton, Dunstable Netball League. I grew up in Stopsley Village, Luton and went to Stopsley Infants and Primary School. In the fourth year of Primary school my wonderful games teacher Miss Barbara Thompson said she was going to enter our school team into a new netball summer league called The Junior Hatters League. I was the school netball captain and already enjoyed playing all sorts of sport, but this was something new and very exciting. 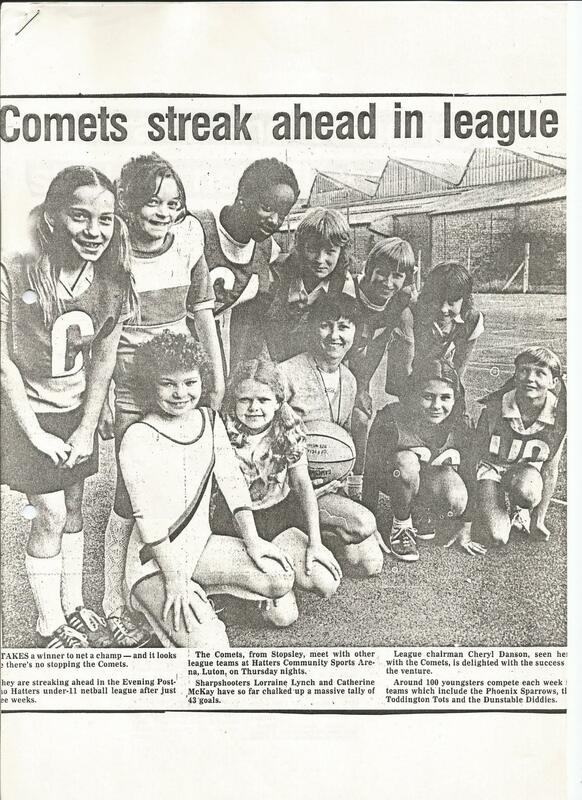 So in the Summer of 1979 my school team entered the Junior Hatters League (in its first year) as Comets. The league was held on the car park of the Luton Town Football Club. Looking back the courts were pretty terrible but of course when you are 10 you don’t even notice things like that! I was so determined for our team to do well and I remember running my socks off at centre and requiring my friends to do the same! The games were so close (usually only a couple of goals between the teams) and we grew in our skills and our camaraderie week by week. Being the sort of 10 year old I was, I made my family travel back from our holiday in Eastbourne so I didn’t miss a week! Our team, the Comets won the League and the Cup that year, but more importantly we shared a summer that none of us would ever forget of fun, drama, laughter and grazes! It was pretty tough falling on that tarmac! The Junior Hatters League was a success, and it grew and grew with each year. I played with my team Comets for several years. We got better and we learned how to win and how to lose and had fun every summer for years. 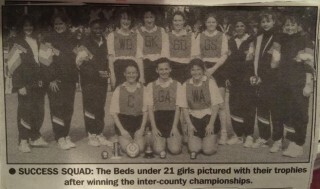 I was the first of many players to start their netball careers playing in the Hatters Junior League that went on to represent England, and the excitement it gave me as a 10 year old stayed with me as a player for my whole career. I feel very privileged to have represented England as a player, and to now be an England selector. I still get so excited when I coach the Hertfordshire Mavericks Superleague side. I was very lucky to have such an amazing school teacher and be around at the time when The Junior Hatters League was first set up to enable children from backgrounds in Luton to engage in netball. I am indebted to those who took the time to run the League on a voluntary basis for so many years.